While shopping for a diamond, many consumers want to know if they can sell or upgrade it at any point in the future. One question we receive often is if it is just as easy to upgrade or resell a clarity enhanced diamond versus a non-enhanced diamond. The answer is yes. Every natural diamond is priced to its own value. An enhanced diamond can be upgraded or liquidated like all other commodities. So how would one go about doing this? 1. 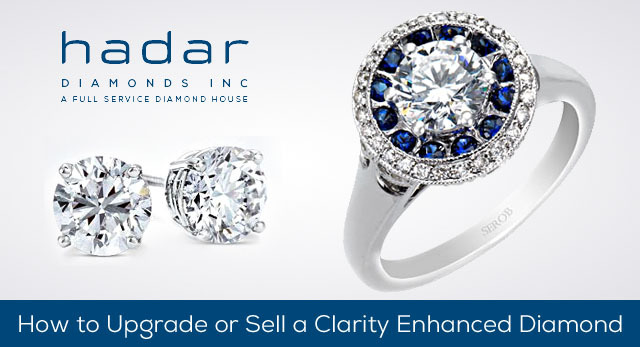 Diamond brokerages: Hadar Diamonds maintains a service allowing clients to liquidate any type of natural diamond, including ones that are clarity enhanced, at a 4-6% commission. 2. Diamond bourses:. These are cash market, diamond exchanges where merchants in the diamond trade buy and sell diamonds. Diamond bourses are located in the United States, and all around the world. 3. Diamond consignment houses: Hadar Diamonds, Inc., offers consignment services where we will help you sell your diamond through our retail network. Naturally, the next question is "How long does it typically take to upgrade or liquidate a clarity enhanced diamond?" At Hadar Diamonds, we estimate 4 business days from the time it is received. For your security, Hadar Diamonds will email you a signed contract prior to you sending the diamond that acknowledges our agreement. When sending the diamond, we request a copy of the grading certificate. Will I lose a lot of money by liquidating a clarity enhanced diamond? Does the diamond depreciate? Clarity enhanced diamonds, like all commodities, including gem quality diamonds fluctuate in the marketplace based on supply and demand. Since 1929, diamonds have decreased only 14 times. The prices have remained stable or increased in value. Each yearly increase in price has exceeded the rate of inflation. Historically, during times of economic uncertainty, inflation, or war, clarity enhanced diamonds, like other gem quality diamonds have increased in value. For more answers and information related to the subject matter covered today, we invite you to contact Gerry Hauser, CEO of Hadar Diamonds. He is also available to discuss the clarity enhancement process, why it is stable, and current market conditions. Since 1978, Mr. Hauser has been a recognized consumer advocate and has advised others how to purchase and sell diamonds. He has been interviewed on KOA and WITC radio. He has also been a guest speaker at Howard Ruff and Jim Blanchard "hard money" investment conferences. He has been quoted numerous times in the Ruff Times and Precious Stones newsletters.